Nipsey Hussle's parents have broken their silence after their rapper son was gunned down and killed in Los Angeles last month (Mar19). 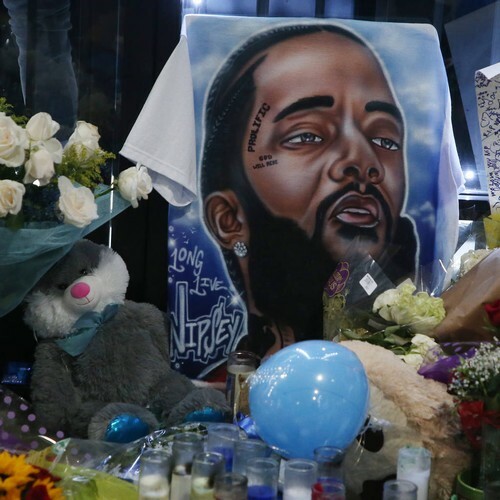 Nipsey's mother Angelique Smith and father Dawit Asghedom were joined by the rapper's girlfriend Lauren London, the mother of his two-year-old son Kross, at the star's grandmother's home in Los Angeles as they remembered their boy in a chat with the Los Angeles Times. Speaking about his son, born Ermias Asghedom, Dawit said he's proud of the powerful messages put across by the musician's tunes. Angelique recalled her son's early years when he was at school and asked to be put in advanced classes, smiling: "He recognised at an early age his own capability. His own potential. He has always known." A memorial event is taking place to honour Nipsey at Los Angeles' Staples Center on Thursday. And, in another move to remember the slain rapper, the intersection of Slauson Avenue and Crenshaw Boulevard - in the centre of where the musician grew up - is to be renamed "Ermias 'Nipsey Hussle' Asghedom Square."